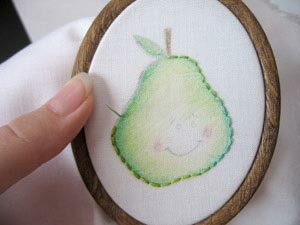 Hand embroidery is wonderful, simple, meditative, and sometimes, a little bit time consuming. This can be a good thing or a bad thing depending on how you like your hobbies, but sometimes when you have a big open blank space, and you’re just not feeling up to large swatches of satin fill, what do you do? Grab your crayons, of course! No, we’re not reverting back to the days of kindergarten (well, not ALL the way back) but it does hearken a bit back to the wonders of coloring books and crayons. 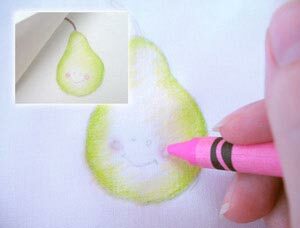 That’s right, you can use crayons to tint and color your embroidery! 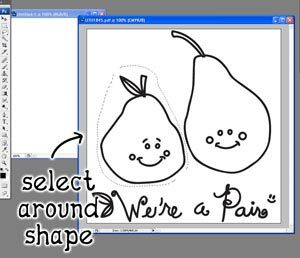 It’s as easy as coloring in the lines, and it produces beautiful, colorful results. I’ll show you how! 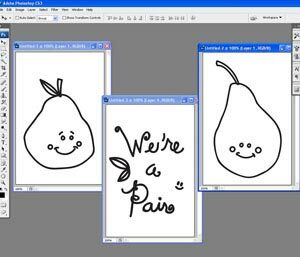 First, I’ll mention that I’m putting my embroidery (We're a Pair) in little decorative embroidery frames, and splitting the design up a bit. To do this easily, I’m separating and resizing everything in Photoshop, so it all prints out perfectly. Measure the size of the hoop you’re going to use. Mine is pretty tiny, with its working space only about 3 inches tall by 2 inches wide. Create a blank document that’s the same size as that. Now use the “select” tool and select around one of the shapes you want to separate out. Copy that section. 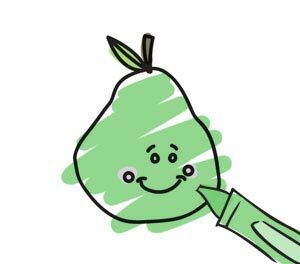 Paste that pear into the little blank document you created, and re-size it in there so it fits inside. That way you know your design will fit perfectly in your hoop. Do this with your other little design to. 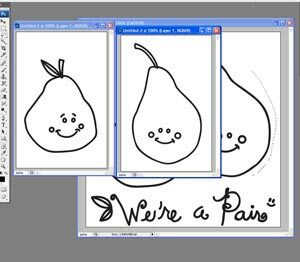 Now I have two happy pears both sized and ready to print. The text as it is wouldn’t fit in my little hoop, so I grabbed each word one at a time and rearranged them in another little document. Now everything will fit in my little hoops! 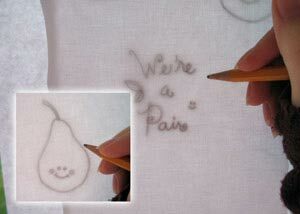 That’s the nice thing about hand embroidery versus machine embroidery -- it’s much easier to play with! Once you have your designs all ready, print them out! First, you might want to test that your designs are going to fit in your pretty hoops. As you can see, all our fancy Photoshop work turned out just dandy. So, let’s transfer our designs. Cut off a piece of your fabric larger than your design and your hoop. My usual blue transfer paper may not show up very well after I’ve colored over it, so I’m using a pencil transfer technique. This works just fine one light colored fabrics, which are best for crayon tinting anyway. Tape your template onto a window, and then tape your fabric on top of that. 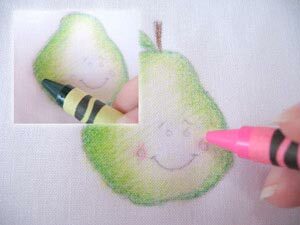 Use a pencil to trace over your design onto your fabric. 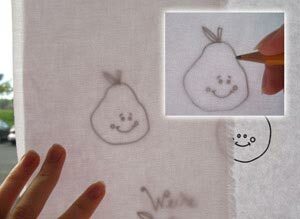 Do this for each piece of your design, tracing each one onto a different small piece of fabric. Now we have three pieces ready for tinting! 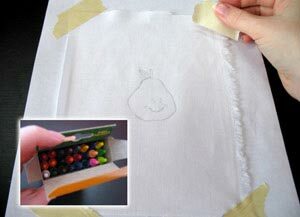 To ready your design for coloring, you’ll want to tape your fabric down on a hard surface. I put a piece of white paper under my design so I could see the color clearly. If I left the black surface underneath it, I wouldn’t be able to see my pretty colors very clearly. We want to tape our fabric down so we can color crayon on it without it tugging or moving and messing up our pretty design. To begin, I like starting with my lightest colors first, especially when building up color. When coloring, start with very light strokes that only go in one direction. Think of it kinda like crosshatching. 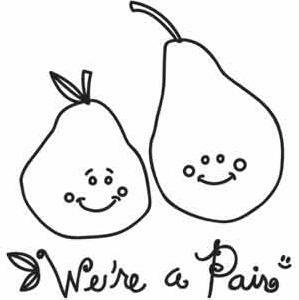 I gently shaded the pear with yellow using light, one-directional strokes. Heavy stokes won’t blend out with the iron, so only make marks that you want to see on the finished product. Once I had my yellow layer down, I began layering a green on top of it exactly the same way, with light, one-directional strokes. Keep building up color gradually. I like getting darker near the edges, so you have a burst of color near where your stitches are going to be. Using darker colors later is also good because they tend to smear more than light colors. Black is especially bad for smearing. 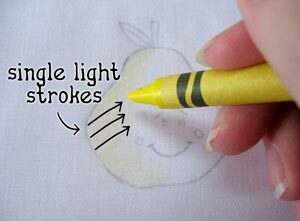 Another tip, if your crayon starts leaving little flakes as you work, don’t brush them off, blow them off, or you might smear them on your fabric! Once you’re happy with your crayon coloring, take two pieces of blank paper, and put one behind your piece and one on top of it. This is to help soak up the melting wax and to keep it from getting on your ironing board or your iron. Set your iron to its hottest setting, and iron over your design. If you’ve added lots of layers of color and wax, you’ll probably start to see color bleed through your paper as the wax melts. This is normal. If you used really light coloring, you might not see anything. 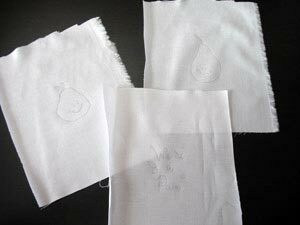 Iron your fabric as much as it can take, so the wax and the color gets nice and melty. When you’re done, your colors will have blended a bit, and most importantly, the color should have set into the fabric. If you want any areas a little more “blended,” add white. If you want to add a bit more shading, use black. Use black sparingly; it tends to bleed and take over other colors very easily. 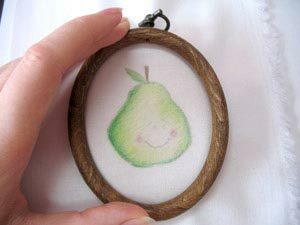 I added white in the middle of my pear to blend his colors a bit, and ironed him again. If you really want to test your color, you can throw your tinted fabric in the dryer to remove any extra wax, and then re-tint it until you get the level of color you want. Yay! Now our fabric is tinted and ready to go! I haven’t had this much fun with crayons since grade school. 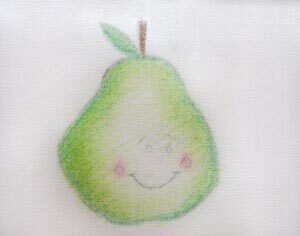 Once you’re happy with your little tinted pear, it’s time to embroider him! 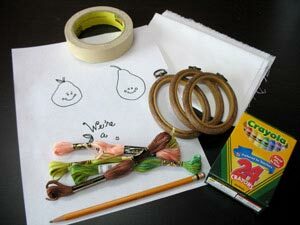 Grab one of your little decorative hoops and hoop him up. 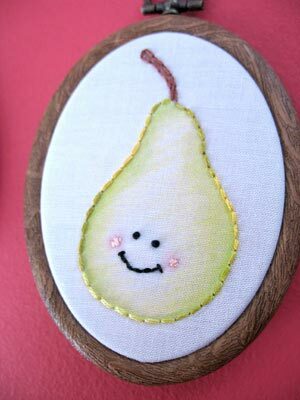 I picked some oh-so-pretty variegated thread to embroider the outline of my pear with. Because this design is a lot smaller and more delicate than what I’ve embroidered before, I’m not going to use as many strands of floss as I usually do. 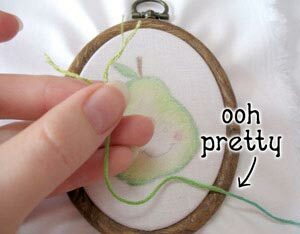 I split my floss in half, so I’m only embroidering with three strands instead of six. When pulling thread apart, take it slow and keep it from knotting up, or you’ll just get mad at it. Embroider your design and way you like. I used back stitch mostly, but decided to use little french knots for eyes and a tiny little satin stitch for his little cheeks. I just love my variegated thread! When you’re done embroidering your design and you’re happy with everything, take a pair of scissors and carefully trim away the excess fabric behind the hoop. If you’re worried your fabric might come loose from the hoop after you trim it, you can run a line of glue around the back to keep it in place. 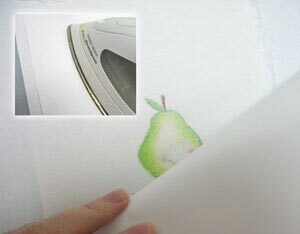 Now you know how to tint your embroidery, go to town! 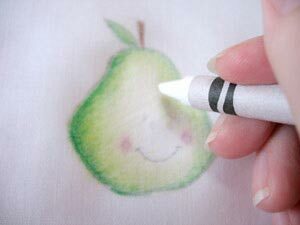 Color in your next little pear and set him under the iron as well. Remember to use light, one-directional strokes. This is a good example of what your paper might look like after you’ve ironed a tinted design. 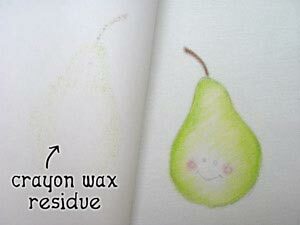 You can see parts of the wax melt and bleed color onto the paper, which is better than it melting onto your iron. 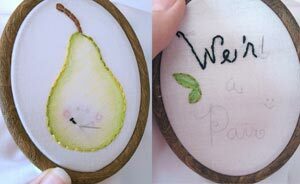 Tint and hoop and embroider away until you have all the little pieces of your wall hanging complete! 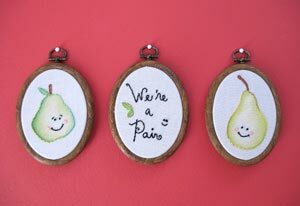 Hang your pair of pears up on the wall for a super cute wall hanging! 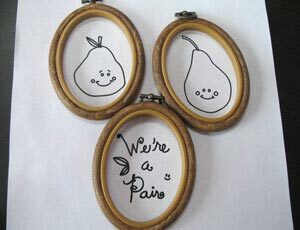 I think embroidery hoops make awesome frames, personally. When they’re filled with beautiful tinted embroidery, all the better! Now if you want to have more color than just the outline, you can tint your embroidery to add that special colorful touch! 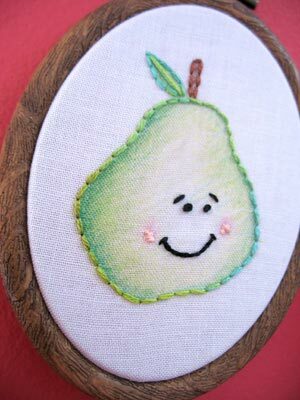 It’s subtle and easy and a beautiful way of dressing up a simple embroidery design. Now my little pears look yummy and colorful and oh so tasty! 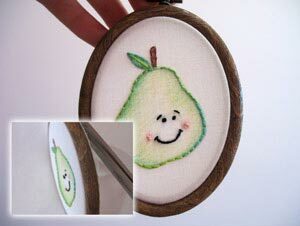 And the little embroidery hoops are a fantastic and simple way of displaying your embroidery that keeps it classic and cute. All you need are crayons and the spirit of kindergarten. Unleash your inner child and go to town with crayons! Liking this coloring thing? 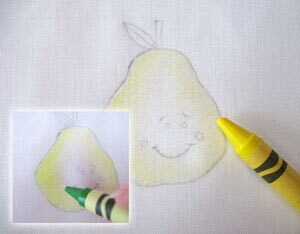 There's an in-depth and helpful discussion on Craftster about the ins and outs of crayon tinting. Pimp Stitch has a nifty little tutorial on the topic. Urban Threadsters have created colorful crayon-tinted incarnations of Derby Girl and the Sweet robot. For more colored-wax-based fun, there's always molding crayons into shapes!